This captivating animated series follows the adventures of a lovable bunch of characters who learn important lessons about biblical values such as godliness, grace, and sharing. Each episode includes a sing-along lesson song. Running time: 54 minutes. 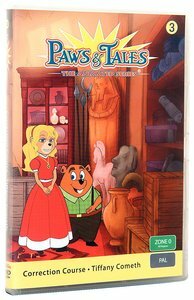 About "Series 1 #03 (Episodes 6,7) (#1.3 in Paws & Tales Series)"
This captivating animated series follows the adventures of a lovable bunch of characters who learn important lessons about biblical values such as godliness, grace, and sharing. Each 27-minute episode features a lesson song to sing along with.